1. Release ALL the fear that is still embedded in your physical earth vessel. 2. KNOW that there is ALWAYS Enough. 3. Maintain your earth vessel for as long as Gaia needs you to. It is NO sacrifice to maintain your earth vessel because your Spirit is forever FREE. Your earth vessel merely represents that YOU are the planet Earth. Therefore, as you release your residues of fear that are in the molecules and atoms of your earth vessel, you are serving to release all fear in your planetary vessel, as well. Furthermore, your fear of not having enough, which is an innate “fear of survival,” can be released when you realize YOU are the planet. As the planet returns to Galactic Consciousness, the humans will return to their true Planetary Consciousness. You, the members of humanity, have reached critical mass regarding multidimensional consciousness, but only because the awakened ones hold so much more light than the masses. 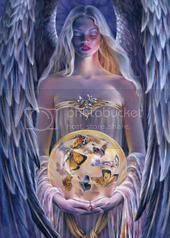 However, many of you awakened ones are still holding a form in fulfillment of your pre-birth contract to partner with Gaia. Also, the physical form that you hold is a representation of your Planetary SELF. Humans, who are the Keepers of the Land and the cetaceans who are the Keepers of the Water are sworn to release ALL attachments to their third dimensional illusions while they retain their earth vessels. Your detachment from illusion while maintaining an earth vessel facilitates the release of ALL fear embedded within your earth vessel, so that you can better assist in releasing all the fear embedded in your collective planetary vessel. It is the knowing that there is always ENOUGH that expedites the release of embedded planetary fear/darkness. While watching a scary movie you may say, “It’s just a movie. It isn’t real.” You can now make the same comment while observing the many frightening third dimensional illusions. Because you know these illusions are not real, you can maintain your earth vessel and continue to play the 3D Game while you also move through your process of ascension. The ascension personal and planetary processes are accelerating more and more each day. Things may look the same on the outside, except that you are finding that things that were once essential to you are no longer important. Competition, wealth, fame and success carry less weight once you realize that the Game of 3D Life is not real. What is REAL is inside. Inside, you are becoming more and more transformed with every breath. Just as thought precedes action, changing your state of consciousness precedes changing your reality. Believing that you are changing your reality places you in a state of consciousness in which you can change your reality. In fact, you are not just changing your reality. You are creating your reality with your every thought. Therefore, remember to maintain your Mastery over your every thought and emotion. You have great power now, and with that power comes the responsibility to maintain your multidimensional consciousness. I, El Morya, serve as the Ascended Master of the First Ray, the Blue Ray of the Power of God’s Will. To avoid religious discriminations, as different religions have different names for the energy they perceive as God, I will speak of the Will of ONE. Dear ascending ones, we Ascended Masters understand how difficult it is for you to forgo your return to SELF in order to remain in service to Planetary Ascension. However, I proudly remind you that YOU are not “remaining” on Earth. You ARE Gaia. You are the portals through which the multidimensional light and unconditional love of the higher dimensions can enter Gaia’s body of Earth. In return, Gaia shares Her expanding light and love through the glory of Her Nature. I will return to speak more of being an Ascended Master while still maintaining a third dimensional earth vessel. We, the Ascended Masters of Earth, remind you that if you have found yourself reading this communiqué, you are an Ascended Master who is still wearing an earth vessel. You may wonder how we could make such a sweeping statement, but you must remember that we are in full possession of our multidimensional perceptions. Therefore, we know you are an Ascended Master because you are ALL Ascended Masters. You did not leave the fifth dimension and beyond to enter third dimensional Earth. No, you expanded your consciousness into the third dimension so that you could participate in this cosmic moment. It is just that you forgot that your earth vessel was actually a puppet, an avatar in a video game. As you awaken to your Multidimensional SELF, you realize that YOU are the puppeteer, the one who chose to log into this reality during this auspicious moment of transmutation. In fact, you spent eons of lives training for this particular reality. One of the worst indoctrinations of this 3D Game was that “You are NOT Good Enough.” We say to you, “YOU are precious!” YOU are necessary and vital for the completion of a great plan that went into motion long before the establishment of Lemuria and Atlantis. YOU are the final chapter in the book of third dimensional Earth. YOU are Gaia, the consciousness of Earth. Those of you who have awakened, have done so because you refused to totally forget your SELF. You may have seemed to forget, but there was always a glimmer of a memory of your true SELF. That memory that was implanted into your Soul during all your lives in which you prepared for this moment of HERE and NOW. You are, indeed, HERE NOW in the process of ascending your personal and planetary SELF. I AM El Morya. It is the Will of the ONE that you succeed. Therefore, you shall! All of us in the higher dimensions know that you will succeed, for in the NOW of the ONE you have already ascended!